Members of congress were in for a rude awakening as HIV activists stormed our nation's capital to fight for their lives. This week, hundreds of HIV activists banned together in Washington, D.C. for AIDSWatch, the nation’s largest annual HIV advocacy event bringing together activists marching directly into the offices of congress to educate them on the important issues impacting those living with HIV. Given that the Affordable Care Act has been under attack since Donald Trump took office, the message to congress was loud and clear: protect our health care. The event crowded the nation’s capital with enough fervor to deafen congress. On the first night of the event, CDC director Dr. Robert Redfield was heckled by HIV activists James Krellenstein and Nick Faust of PrEP4All.org after he sidestepped questions on the exclusivity and cost of the HIV prevention drug Truvada (or PrEP). Krellenstein and Faust were behind The Washington Post story reporting that the CDC has owned the patent for Truvada since 2015, and has yet to collect a dime from its makers, Gilead. Last year, Gilead made $3 billion from PrEP alone. Multiply that by four, and you can imagine how much money CDC might have received (but never sought), which could have gone to fund programs that benefit HIV-positive people — not to mention, allow more access to PrEP. The heckle was caught by Plus magazine. See below. The Trump administration has proposed $291 million dollars in their new budget for ending the epidemic, despite the fact that billions of dollars in PrEP royalties are being ignored by the CDC, according to the Post article. But as health care continues to be threatened, those living with HIV are not letting go of the fight. 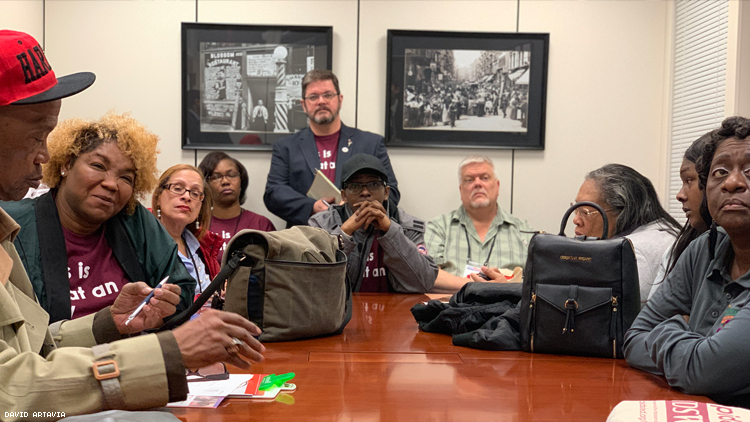 As the day went on, members of congress got an earful about the serious issues impacting not only HIV-positive people, but the growing numbers of hepatitis C transmissions, the lack of access to treatment for many, and the lack of access to PrEP.